If you are dreaming of a career in the solar energy industry, or of finally disconnecting your home from the electricity grid, you a guide. Something to explain the terms, the technology and how to apply it. You need a solar electricity Manual or Handbook. Full disclosure. We did not write this book but for sure we are recommending it to our readers. The amazing thing is we have found this book selling on Amazon for over $ 400! That is crazy, so stay away from the re-sellers. We made sure that if you buy it through the links we provide you will get the best price. Computers ensure the mirrors are always maximizing the available sunlight for concentrated solar electricity generation. We wanted to find an inexpensive, yet comprehensive and up to date, solar electricity manual that would be of help to readers that are new to solar power as well as experienced solar project leaders and home solar enthusiasts. The book comes with website permissions for all of the calculators and tools that you will need to complete any solar electricity project or become an expert in the field. The solar parking canopy is great for electric vehicle charging at work and a hot new career path. The best careers in this decade will be in the area of renewable electricity and solar is by far the leading technology. You will find all of the answers to your questions and ones that you did not even know to ask in this latest version of the solar electricity handbook. Click Here To See The Best Price For This Solar Electricity Manual. This is the book ( and reading our magazine ) will give you all the knowledge you need to succeed. Clear examples, diagrams and example projects are provided to demonstrate the true capabilities of these systems. 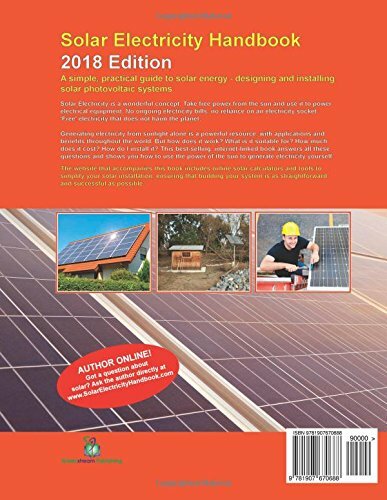 For 2017, this book has been extensively updated – with new chapters, new diagrams and updated information, ensuring it offers completely up-to-date information about solar technology. It’s available as a paperback with black and white diagrams, or in hardback with full colour pictures throughout. What Else You Get with the Solar Electricity Manual. The web site that accompanies this book includes online solar calculators and tools to simplify your solar electricity installation, ensuring building your solar electric systems is as straightforward and successful as possible. Solar Energy is a wonderful concept. Take free energy from the sun and use it to power electrical equipment. No ongoing electricity bills, no reliance on an electricity socket. ‘Free’ solar electricity that does not harm the planet. Of course, the reality is a little more complicated than that. Yet generating electricity from sunlight alone is a powerful resource, with applications and benefits throughout the world. This best-selling, internet linked book answers all these questions and shows you how to use the power of the sun to generate electricity yourself.